We all know that the BlackBerry Passport is the company's big time handset for the enterprise. But for those who just want to have that old-school BlackBerry hardware powered by today's BlackBerry 10 OS, there is the BlackBerry Classic. Already available for pre-order from BlackBerry's own online store, the device is priced at $449 and should ship in the middle of this month. BlackBerry has produced a quick video that shows us around the Classic, which features a trackpad and the return of the function keys. 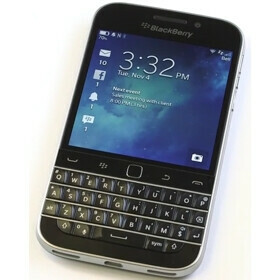 And of course, there is that physical QWERTY keyboard that BlackBerry is known for. The video also shows off the browser, which is said to be three times as fast as the one on the BlackBerry Bold 9900. And apps can be picked up from BlackBerry World and the Amazon Appstore. Check out this quick video of the BlackBerry Classic by clicking on the video below. Dear VZW, stop bulls**tting and make this and the passport available. The real question is, WILL IT SELL? The REAL question is… WILL YOU EVER STOP TROLLING BLACKBERRY? The real question is... Will they ever get laid by a human? The answer to BobbyDigitals question and Crispin_Gatiezas question is NO. They will remain trolls never touched by a human. They already did genius, it's called the Z30. What Z30? I never see it on the street? Wait, you mean the phone that don't sell at all despite having a Blackberry brand? You wouldn't know a Z30 if it smacked you in the head, troll. Dude, get a life and stop trolling BlackBerry. The Classic is better than an "old Nokia feature phone". It will sell. QUESTION IS HOW MANY? And how many phones do you sell? What multi-billion dollar company do run? Or multi-million dollar company? None? That's what I thought. Ouch.... I will mark your word. The classic will not sell at all, because the one that still using 'clasic' bb has no money to buy brand new overprice bb s**t. When they have money, they will invest in other phone called cheap android or cheap wp. and then moving the BBM to that phone. EDIT: well, perhaps you the only one that will buy it to add to growing list of what you claim, you have the phone. Yes, mark my words, troll. I would make a monetary bet with you, but seeing as how you cannot even spell correctly and use only sub-100 dollar Android phones, you couldn't afford what I would want to bet, anyway. And don't get jealous that I can afford multiple phones a year, while you can only afford one every 3 years. MG, He's been spewing the same crap for months now. And he doesn't even know what's going on in his own country of Indonesia. How can anyone take anything he says seriously, even the other trolls? Agreed, ablopez. This guy is up there with the worst of the uninformed trolls.